We have installed most modern plant & machineries for drawing as well as Insulating of Copper Wire. The company is also equipped with latest material handling equipments like Crane, Forklift etc. for easy handling of materials. Weighment and packing of material is done through computerize barcoding labeling. 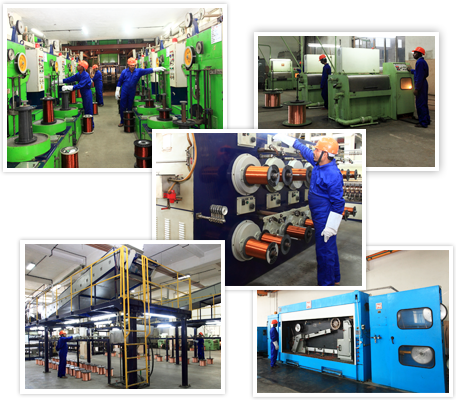 Selecting equipments, manpower, maintenance, manufacturing & after sales service……., we maintain high performance standard in all our activities. To produce concentric conductors, free from surface defects and excellent mechanical properties, low oxy electrolytic grade copper is drawn in Tandem high speed RBD wire in line resistance annealing machine. The best available Varnishes are used to impart di-electric strength & corrosion resistance while systematic periodic & preventive maintenance enable us to live up to high Corporate standards & delivery commitments.